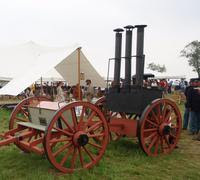 The Confederate cavalry rode into our camp, eyeing the iron contraption with three tall smokestacks mounted on a wagon near my tent. "Are you interested in our coffee wagon?" I asked. I explained that it was a working replica of those that the U.S. Christian Commission built during the Civil War. It could brew 108 gallons an hour, and was one tiny part of the vast aid supplied by the Christian Commission to both Union and Confederate soldiers. Since I was talking to Rebs and we happened to be in Gettysburg, I pointed out how the Christian Commission was crucial in caring for the 6,800 Confederates among the nearly 21,000 wounded troops left behind in Gettysburg after both armies pulled out. "Where are you from?" I asked them. "Alaska," one of the rebels replied. We were on a farm in Gettysburg last week for the 145th anniversary of the battle that saved the Union. Beneath my apron I wore a badge that designated me a "Living Historian." 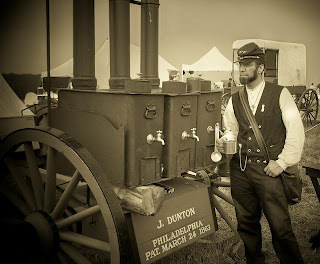 Many re-enactors have a "Civil War gene," and are obsessed from birth with America's bloodbath. I am not one of them. I married into the cult. I grew up in California, where the Civil War seemed as distant as the War of the Roses does to Pennsylvanians. But I was a fifth-generation Californian due to the Civil War. My Rodgers ancestors were Union sympathizers in East Tennessee who fled to San Francisco in 1863. I knew that my husband, Rea, was a re-enactor before we first dated in 2003. I told him I would never do mud, blood or corsets. But after six months, I knew that I had to try or resign myself to many weekends alone. Re-enacting isn't a hobby, it's a lifestyle. Gettysburg is full of Civil War dress shops. But my first visit to our nation's hallowed ground was in jeans and work boots. Our unit portrays the 9th Pennsylvania Reserves, and each May we go to the 9th's monument to clear brush. We help keep the park accessible, and honor those who died. Seeking a civilian to portray, I stumbled onto the little-known history of the Christian Commission, an evangelical mission to the Union Army. It's motive was to save souls, but it became an extremely adept relief organization that saved many lives. It appealed to me because I knew church history and understood its context. 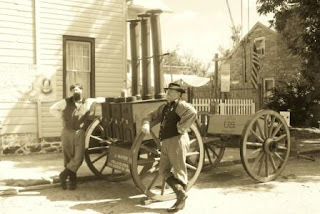 I sometimes serve as a guide at the U.S. Christian Commission Museum in Gettysburg, which set up the encampment where I showed off the coffee wagon. I'm now working on my impression of Jane Boswell, a doctor's widow and devout Lutheran from Baltimore who went to many battlefields with her 19-year-old daughter to care for the wounded. Developing a good impression is like researching a master's thesis. I have to learn the (complicated) wartime history of Baltimore and the aftermath of several battles. I've learned to redo myself as a 19th-century woman. Details are everything. I love counted cross-stitch, a popular art in the 1860s. I knew I'd created an accurate impression when tourists briefly mistook me for a ghost as I browsed a Gettysburg bookstore lodged in a Victorian house. I suspect re-enactors are at the root of many ghost stories. But I explained who I was, and the tourists took their children's picture with me. Re-enacting is not just about battles. I've been doing this since 2004, and this month's Gettysburg re-enactment was the first battle I've attended. Mostly I've done living history, whether for the National Park Service, at historical societies or for the Carnegie Library in Carnegie, where our unit maintains a room in which Union veterans used to meet. Re-enacting is about teaching and preserving history. We return to the 9th's monument each November on Remembrance Day, the anniversary of Lincoln's Gettysburg Address. Thousands of re-enactors, both Union and Confederate, pour into town for a parade unlike any other. I've got no sympathy for the Confederate cause, and I'll argue if the modern-day rebels claim the South wasn't fighting for slavery. But there is nobility in the butternut re-enactors who return each year to the scene of their side's great defeat. They're not doing it to start a new rebellion or to bring back slavery. They are there to fulfill the hope of grieving mothers long ago that their sons would not be forgotten. After the parade, I join my husband and the other men, and we march to the foot of Little Round Top. There we lay a wreath and pray at the monument to our unit. We remember the boys who died so long ago. We remember the men and women who sacrificed to care for the wounded. We remember, and we teach, in the hope that this history will not be repeated. United States Christian Commission's museum and education center is located in Virginia Wade's birthplace on Baltimore Avenue in Gettysburg, Pennsylvania. Disclosure: The Civil War Librarian is the spouse of the Ann Rodgers, Staff Writer, Pittsburgh Post-Gazette. Excellent post! And I love the idea of the reproduction coffee wagon. What a great thing, that many folks probably would never think of. I love it! CWL---Who Saved Little Round Top?